Yum Cha Express, Dim Sum Delivery | JACQSOWHAT: Food. Travel. Lifestyle. Do note that all delivery has a minimum order of SGD 70, this service is especially useful for office parties and special gatherings. Thanks to Yum Cha & TIN, I get to savour these dim sum at the comfort of Yum Cha's head office which felt nothing but home. There is also a delightful variety for vegetarians; Vegetables with Bai Ling Mushrooms, Home Made Bean Curd with Mushrooms & Vegetables and Vegetables with Mushroom in Oyster Sauce. To ensure mouth-watering, fresh and piping hot food are delivered, the foods are packed in microwaveable paper boxes and transported in a specially customised bag with an internal heating element. Table feast during the Yum Cha's party. 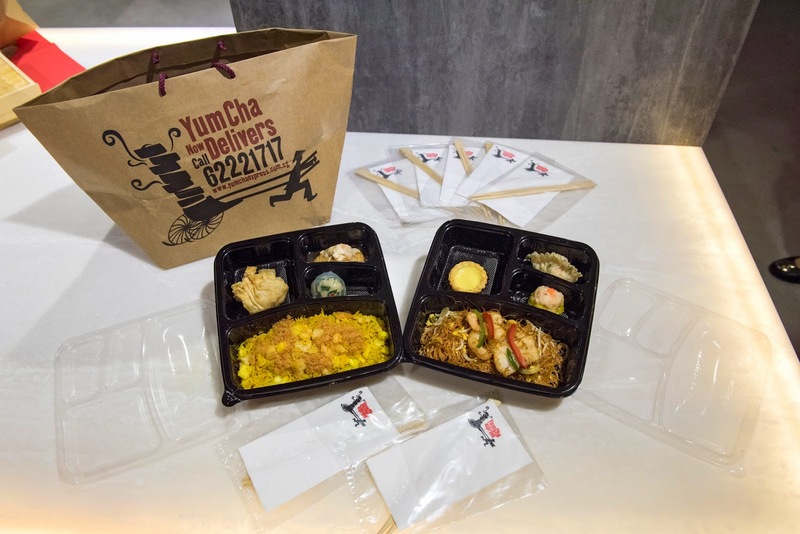 Yum Cha Express provides an extensive variety on their menu; you will be spoilt for choices. 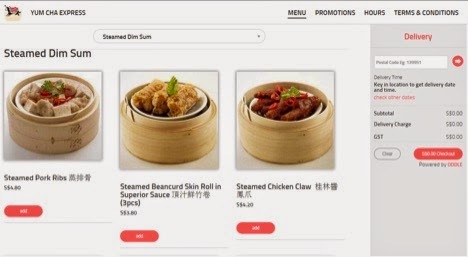 Aside from the selection of steamed or fried dim sum, seafood dishes like Seafood Fried Rice, Seafood & Conpoy Fried Rice, Seafood Vermicelli, Special Salted Egg Prawns, Poached Prawns with Chinese Wine, Famous Black Pepper Crap, Signature Chilli Crab and Salted Egg Baked Crab are available in the delivery menu. If you're reading this and planning to order your next dim sum feast, good news for you being my readers. 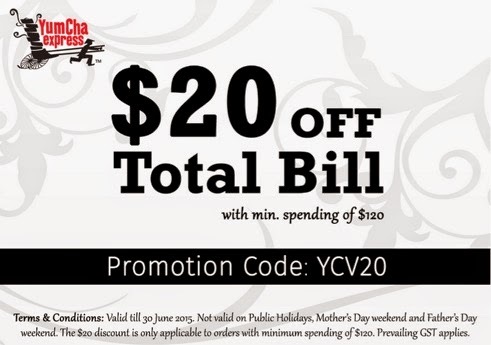 Apply promo code 'YCV20' to enjoy $20 off total bill when checking out, with minimum spending of $120. 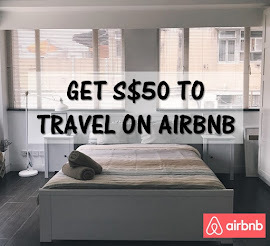 Enjoy while it is valid till 30 June 2015. 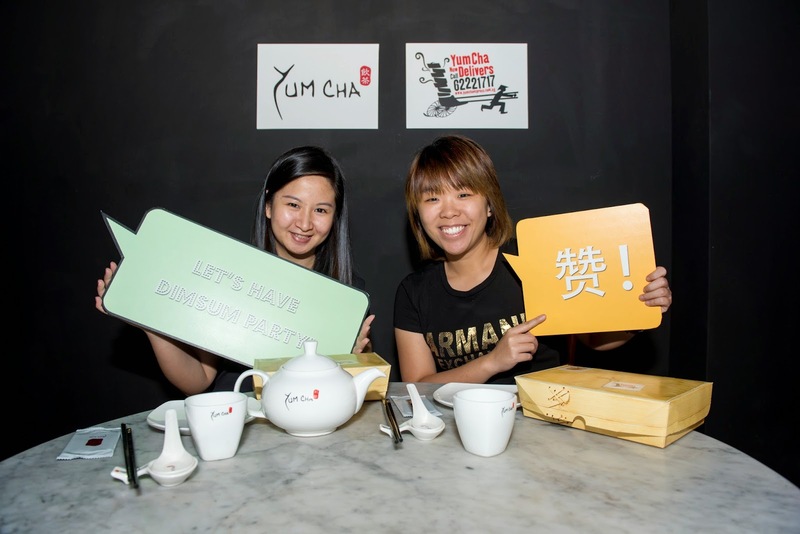 Also, stand a chance to 'Win a Dim Sum Party' worth $300 from Yum Cha Express! 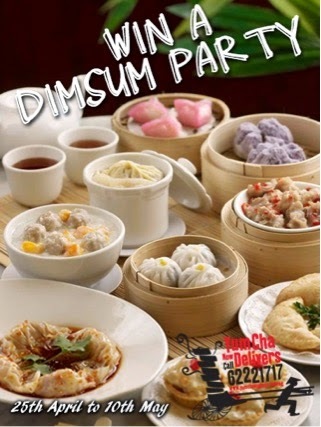 Simply tell us why you want to win a Dim Sum Party and one lucky winner will be selected. Visit https://www.facebook.com/yumchasg to find out more information about the contest. 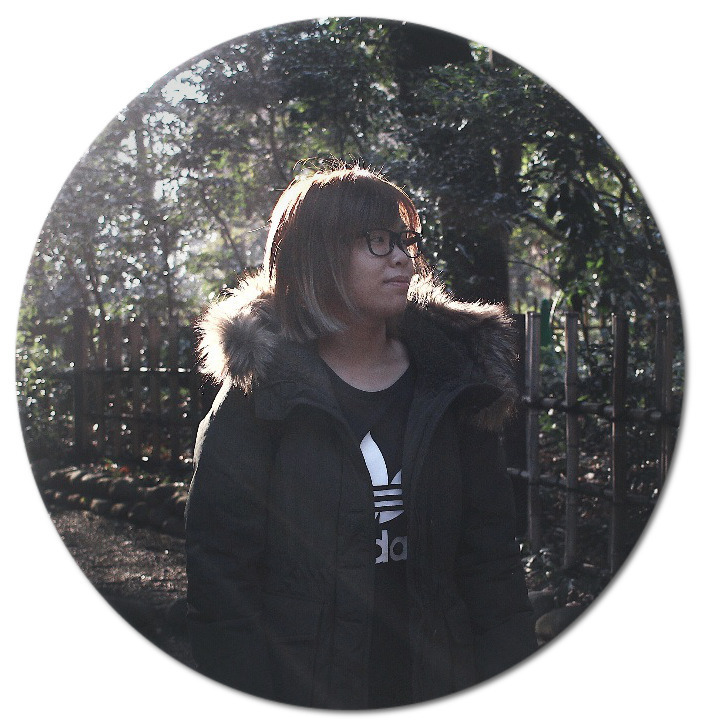 Back to the main highlight, how to Order? 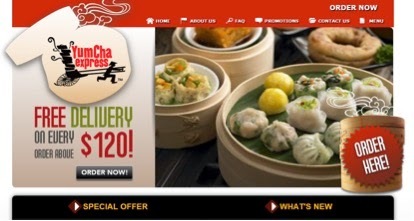 Step 1: Simply visit http://yumchaexpress.com.sg/ and click the 'ORDER NOW' button! Step 2: Browse through the extensive menu which be found here. Then click the 'ADD' button to add to cart. Enter your postal code and click the red arrow to generate location. 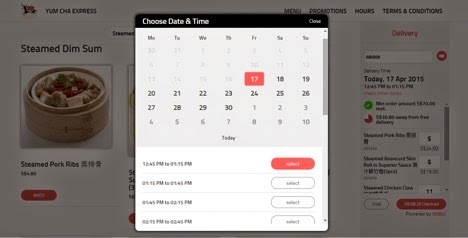 Step 3: Select your delivery date and timing by clicking on 'Check other dates'. *For every delivery order, there will be a surcharge of SGD 12. However, delivery is free for orders above SGD 120. For Jurong Industrial Area and Tuas, a SGD 20 delivery charge applies. For festive seasons, an additional surcharge of SGD 38 applies. 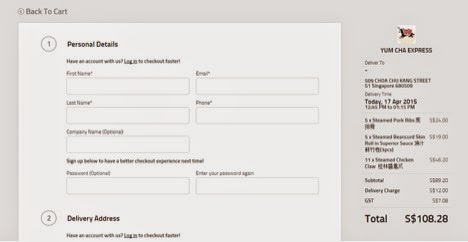 Step 4: Lastly enter your personal details, delivery address, delivery date & time, number of pax, promotion code (if any) and preferred form of payment. There are 2 payment methods - credit card (Visa/Mastercard) and cash. If you would like to pay by credit card, please state it in the remarks section. Otherwise, it'll be cash upon delivery. Click “SUBMIT ORDER” and get ready for a dim sum party! Photo booth at the Dim Sum party! Well known for mouth-watering dim sum delicacies, Yum Cha Restaurants have also increased the repertoire of the menu from sumptuous spread to seafood dishes like the award-winning black pepper crabs. 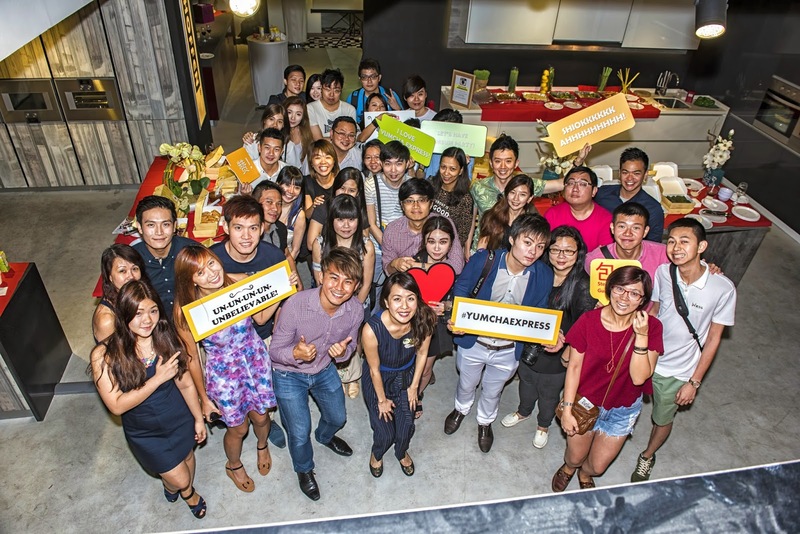 Had a great feast of delivered dim sum at Yum Cha head office, thank you for having us!